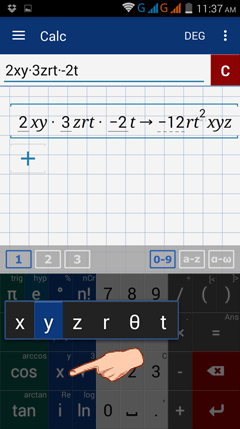 Tap the x (variable) key to cycle through different variables x, y, z, r, θ, and t.
Find the product of 2xy, 3zrt, and -2t. Note: Use a dot to indicate multiplication. Enter the expression as given: 2xy, 3zrt, and -2t using the variables listed under the x key. Note: another way to enter different variables is to use the Qwerty keyboard. 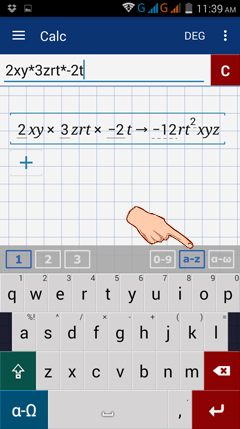 Tap the a-z button next to the 0-9 button to enter a variable. Tap 0-9 to go back to the number keyboard. Enter a variable and equate it to its expression (in numbers or in terms of another variable). Do this for each variable with one per line. Then enter the expression that relates these variables. If x = 2 and y = -2(x +2), then what is the value of 2x/3y? 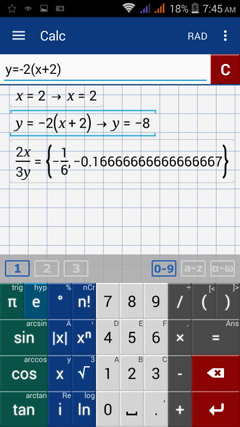 2) Type: y = -2(x+2). Enter y by tapping x twice.